This is .308 Corbon Performance Match 168gr. Boat Tail Hollow Point Ammo. 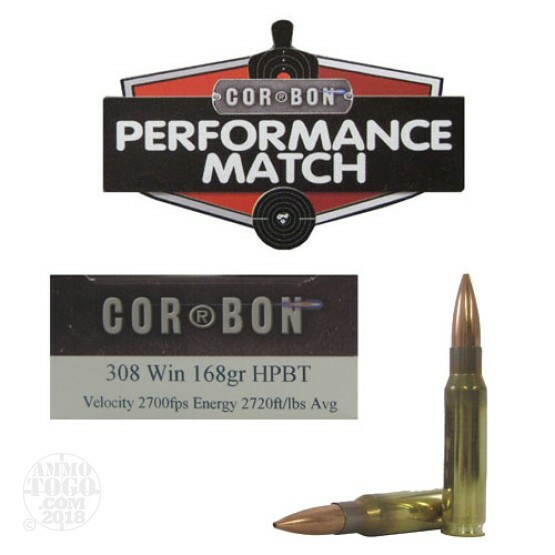 Uniformity and accuracy are the key ingredients in CORBON's Perfomance Match ammunition. Utilizing match grade components, it's the perfect choice for the combat target shooter, I.D.P.A. competitor or law enforcement officer. If you are looking for high velocity target ammunition with high accuracy, Performance Match should be your choice. Like no other, Corbon's JHP loads have proven stopping power. Their JHP loads come loaded with higher velocity and more energy values then their competitors. What you'll get is a bullet traveling faster, but on impact the higher velocity will cause the hollow point to expand into A mushroom shape dispersing its energy into the target. Energy dispersal is the key to COR-BON's proven stopping power. This ammo is brass cased, boxer primed, non-magnetic and non-corrosive. It comes packed in 20rd. boxes. Muzzle Velocity: 2700 fps.